With population expanding, immigrants arriving, rapid industrialization, and urbanization, it is little wonder that late-19th century Americans viewed their simpler colonial past as a Golden Age. Emerging wearily from Reconstruction, Americans patriotically celebrated their past and future at Philadelphia’s 1876 Centennial Exhibition. The “New England Farmer’s Home and Modern Kitchen” was a particularly popular exhibit. Inside this log cabin, women in colonial dress exhibited artifacts such as a Pilgrim’s cradle and spinning wheel, idealizing an America heroically hewn out of New England by hard-working colonists. Poems like Longfellow’s The Courtship of Miles Standish (1858), sang of Priscilla the Puritan maiden, “never idle a moment,” laboring virtuously at her fireside spinning wheel. Such stories imbued the colonial past with an appealing rectitude. Popular taste for the colonial, no matter how loosely defined, was fueled and fed by entrepreneurs like Wallace Nutting. His Old America Company sold reproduction furniture and textiles, and millions of hand-tinted photographs of bucolic landscapes and colonial homes with period-costumed ladies. Concurrently, interest in studying and preserving history was growing. Organizations like the Society for the Preservation of New England Antiquities (1910) were formed. The Metropolitan Museum of Art opened its American Wing of period interiors in 1924. And in 1926 Rockefeller and Goodwin began restoring Williamsburg from a “straggling, dusty ghost” to its 18th century character, while H. F. du Pont began transforming Winterthur. With some degree of patriotic and aesthetic reaction against popular European revival architectural styles, architects and historians rediscovered America’s past. Colonial buildings Jefferson once characterized as “rude, misshapen piles of brick” were now admired. From books such as Early New England Interiors (1878) to Whitehead’s Monograph Series (begun 1916), photographs and measured drawings of early American buildings became available while scholar-architects like Fiske Kimball wrote about America’s architectural history. Whether custom designed for the wealthiest, or distributed as a kit through catalogues like Aladdin Houses or Sears and Roebuck, Colonial Revival houses, and their good taste, were now democratically available to all. Colonial Revival architecture purposefully draws upon English, Dutch, or even Spanish colonial architecture, as well later Georgian and Federal styles; though buildings are generally larger and proportions more slender than historical examples. Details are borrowed freely, but not without care. If architects began loosely interpreting the past, they were soon fluent and creating new architecture worthy of its sources. With its combination of nostalgia and patriotism, reaction and rediscovery, popular taste and academic inquiry, the Colonial Revival is a complex part of American material culture. One may argue that the colonial lives on today in the worst pseudo-traditional architecture populating American suburbs. On the other hand, the architecture of early America, its rediscovery during the Colonial Revival, and much of today’s Contemporary Classicism all branch from the same Classical root. In this architectural lineage the highest ideals of American culture are manifest. 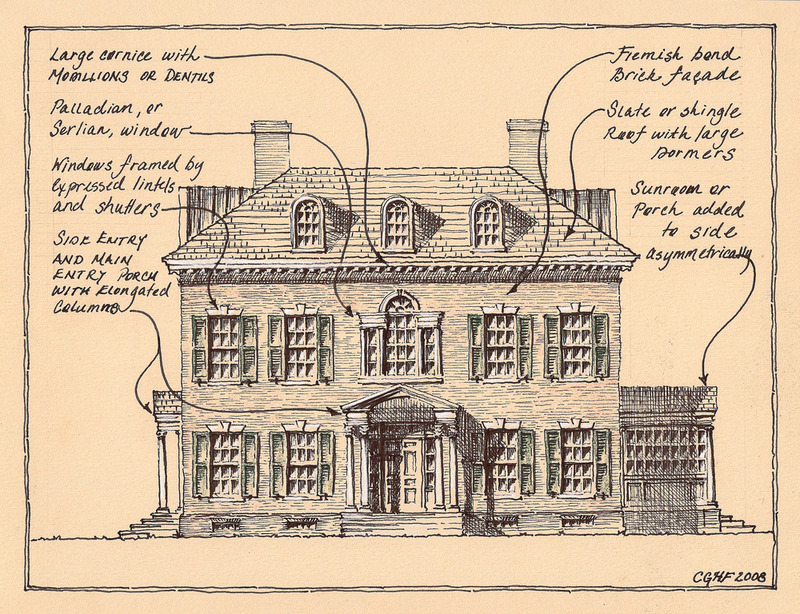 For more on Colonial Revival architecture read Richard Guy Wilson’s, The Colonial Revival House, and Brent Hull and Christine G. H. Franck’s Winterthur Style Sourcebook: Traditional American Rooms. The above books and more on America’s traditional domestic architecture and classical architecture may be found at my online bookshop. This entry was posted in Classical Architecture, House Styles, Residential Architecture, Traditional Architecture, Uncategorized and tagged Classical Architecture, Colonial Revival, Domestic Architecture, House Styles, Residential Architecture, Traditional Architecture on May 4, 2011 by cghfranck.